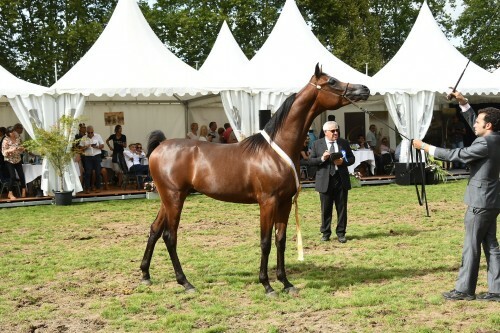 The international B-Show, organized under Daniel Souppat’s stewardship and powered by the main sponsor Albidayer Stud, UAE, is a popular qualifying chance for Class A shows. However, the Vichy Championship offers much more. For those who did not visit the Stade Equestre Du Sichon in Vichy, France, before let me say this: it is a setting with style. Vichy is a famous spa town three hours south of Paris – and was Napoleon III.’s favourite healing haunt. With its lengthy history, spas, amazing architecture, parks and manmade lake on the River Allier, the town is worth a visit, not only for Arabian horse lovers. The Sichon Stadium fits into all this rich history as it has been hosting the competition of the Société Hippique Française (SHF) since 1887. Originally, the ground was just a meadow. A desire to move the competition from Lyon to Vichy meant that the town had to build a 600-metre racetrack around a competition ground on the Sichon site, and a magnificent stand, designed by Gustave Eiffel; yes, the very same man who designed the Eiffel Tower. 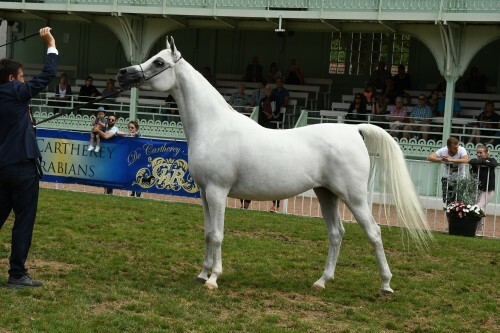 Dubai Arabian Horse Stud, UAE, was probably the most successful breeder at the show, winning Gold Champion Yearling Female with D Wasayef, Unanimous Gold Champion Senior Male with D Khattaf and Unanimous Gold Champion Yearling Male with D Ibn Rasheem. The later was also announced as Best In Show. As the name suggests, D Ibn Rasheem is by FA El Rasheem. His dam is the lovely bay Marwan Al Shaqab daughter Angeliccah out of BFH Dark Angel by RSD Dark Victory. Angeliccah herself was 2007 Top Five Arabian Breeders World Cup Las Vegas and 2011 Gold Champion Senior Mare in Citta di Castello, Italy. For sure, there is a bright future for her young bay son D Ibn Rasheem. In addition to the typical championships the Arabian horse show in Vichy always offers some special awards. Redwood Lodge Saffiqua, a 2009 born grey mare, received the title of the Best French Horse after winning Gold Champion Senior Mare. Bred by Stephen Patrick and proudly owned by Al Sagran Stud, Redwood Lodge Saffiqua is by Redwood Lodge Artique and out of Redwood Lodge Saffron. The maternal and paternal grand dams RL Romantik and RL Antiguaa are full sisters in blood combined with the influential sires WH Justice and Al Adeed Al Shaqab respectively. The title Best Foreign Horse received Perseus KA, who also achieved Gold Champion Junior Male. The chestnut three years old Espressivo son is out of Phirouettes, bred by Paul Gheysens, Belgium, and owned by Daniel Grossi, Italy. The honours for the Best Straight Egyptian (and Oldest Straight Egyptian) went to Ramses Mishaal Nadir, an eleven years old grey Mishaal HP son out of Ramses Minx, bred by Lucille Dietrick, USA and owned by Firas Fuad Mashal. L’Imperatrice EA, a 2011 born Shanghai EA daughter out of Lamira, archived Best European Mare for her proud owner JJ Arabians, France. Once again, the Vichy Show was a fabulous event with excellent horses and wonderful people. We congratulate all of the champions and also each of the other competitors on their achievements and thank them for participating and making it such a wonderful weekend. Thank you also to all of the show sponsors – especially Albidayer Stud as the main sponsor, represented by manager Dawn Martin - for their support of this show and our beloved Arabian horses!